Click any question to get an answer. Interior paint typically gets dirty in many situations: hand prints around switches and knobs; splashes in kitchens and bathrooms; marks on hallways and corridor; “soot” accumulating above electric lamps and other heat sources. Removing dirt before it accumulates not only improves appearance, it reduces chances of it getting permanently embedded in the paint film. Check for dirt periodically; and assume it will be present in and near cooking areas (airborne cooking oil) and at all places at hand height. Always initially clean the surface with a mild detergent with a sponge or a soft cloth; resort to harsher cleaners only when necessary, recognizing that alkaline cleaners can dull the sheen or gloss of oil based paint. Abrasive cleaner will burnish nearly any paint, and will dull the gloss of satin, semigloss and gloss products. Washed surfaces should be rinsed thoroughly because residual cleaner can interfere with adhesion of paint applied later. 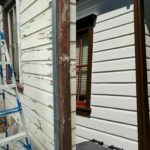 How long does my exterior painting job last? 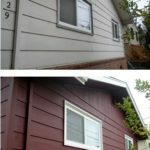 Generally exterior painting job will need to be redone every 5-10 years. Stucco tends to last longer, wood on the other hand expands and contracts more with changing temperatures which loosens the paint sooner. It is best not to put off your exterior painting until the house is badly peeling. When it gets to that condition it will end up costing you more in preparation time and possibly dry rot repair work. 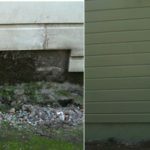 If however the property is in a bad condition when you get to it, do yourself a favor – go the extra length and ensure that thorough surface preparation is done. The idea is to create a sound surface for the new coats to adhere to. This requires more time but is necessary for the paint job to last. It is generally understood that color combinations that appear pleasing are made up of colors that are in harmony or in balance with each other. Colors that do not appear to agree with each other or that clash are not in harmony. Whether on the interior or exterior painting we normally start a client out with a chart of stock colors. Stock color paints tend to perform better due to the process of their manufacture. On the exterior paints chart there is also a nice variety of harmonious color combinations to choose from. Another very good way to get started on colors at exterior color selection is to take a drive around the neighborhood and find similar houses to yours to see what others have done with colors there. 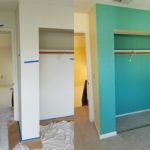 This way you get a very good idea of what the final look of your home might be. We can provide you with cardboard brush outs, or roll out samples directly on the areas to be painted. Many clients find this process helps them to better visualize the final result. Latex paints are more environmentally friendly than oil based paints. 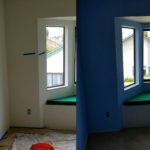 With oil based paints there are paint fumes to contend with can be particularly bothersome on the interior painting job. There is also a by product of dirty paint thinner that requires a trip to your local toxic waste site. 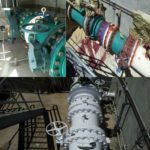 (We always get rid of this waste as part of our work) There are other factors as well: Latex primers and finishes have been improving tremendously over the years and are very durable. For instance a latex finish on an exterior painting job will stay elastic for years where oil based paint dries to form a hard and more brittle film. 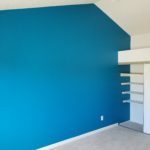 Surfaces expand and contract with weather and while the latex paint will move with the surface – the oil will tend to crack sooner with this movement. The advantage of using oil paints is that it will give you a smoother look as it tends to layout better on the surface not showing brush marks as much as latex. Also, as was already mentioned, oil dries hard so it tends to be more washable than latex. The term surfactant leaching is used to describe spots or streaks of sticky brown or colorless material that appears on the surface of freshly applied latex paint. Surfactant leaching is a common paint problem that may occur with any brand of latex paint. The spots or streaks caused by surfactant leaching, while unsightly, are not harmful and do not affect the performance of the paint. Surfactants are ingredients in paint that are critical to the performance properties of the paint such as its color, stability, flow, and leveling. These materials usually evaporate in good drying conditions, or they are locked into the paint film. The staining occurs when drying conditions cause the paint to dry too slowly, allowing the surfactants to rise to the surface of the paint. The spotting and streaking occur when moisture condenses on the fresh paint and draws the surfactants rapidly out of the paint film. Heavy condensation will cause streaking from the run down of surfactant rich water. Surfactant leaching usually occurs during the spring and fall when the daytime temperatures drop below the dew point rapidly, or when temperatures are low and humidity remains high. In costal areas, such as San Francisco, marine layer can suddenly increase humidity and cause surfactant leaching any time of the year. The process can take as little as 4-5 days from the time we connect with you. 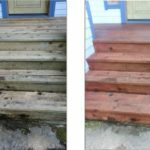 However, it can take longer depending on the condition of your surfaces, the type of work required, and weather conditions if the project involves exterior work. 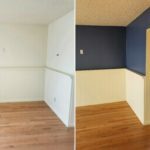 During our consultation with you, we will evaluate your situation and can let you know how long we think it will take to complete your painting project. They provide even light reflection and give the surface a softer, more uniform look. They don’t highlight surface imperfections like higher sheen paints, so they usually don’t require as much surface preparation (like patching, texturing or sanding) prior to painting. They are much less likely to show ‘lap marks’, so they are generally easier to apply and touch up than higher sheen paints. (When one painted section dries before the next section is painted, the two sections won’t flow together into a uniform film, resulting in a ‘lap mark’.) They don’t need to be sanded or de glossed before repainting, unlike higher sheen paints. They are less stain and scuff resistant than higher sheen paints, so they should not be used on surfaces that will be handled, washed or scrubbed frequently. They are less moisture resistant than higher sheen finishes, so they are not the best choice for areas that are exposed to high humidity levels, like in the bathrooms, or on surfaces that will be washed frequently. They have better stain resistance, so they resist dirt pick up and stay cleaner longer. They have better scuff and wear resistance, so they’re good for high traffic areas and on surfaces that are handled, washed or scrubbed frequently. They have better moisture resistance, which makes them ideal for surfaces and areas that are frequently exposed to high humidity levels. They tend to highlight any surface imperfections. They are harder to touch up than lower sheen paints, because the higher sheen tends to highlight the slightly raised surface of the film where the touch up was done. They usually need to be sanded, de glossed or primed prior to repainting, to ensure good adhesion of the new paint. 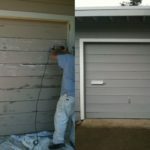 Yes, we schedule each job to be completed in consecutive days, on exterior jobs if weather permits. We use the only professional quality paints from Sherwin Williams, Kelly Moore and Benjamin Moore unless the customer request a different brand. On interiors, after you have removed your personal items all areas or items remaining will be covered with clean drop cloths or plastic sheeting. On exteriors: shrubs and surrounding areas are protected so that no evidence of paint or paint peelings remaining. Just move the small items and breakables. Solidarity Painting will move and protect all of furniture and fixtures. First, scrub a small area with a solution of household detergent and warm water. Rinse well and towel dry. Then soak a cotton ball, Qtip or soft rag in alcohol and rub it back and forth over the cleaned area. If paint comes off, it’s latex. If not, it’s oil based. In either case, proper prep is key. 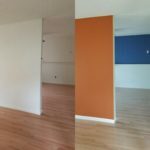 This Santa Rosa painting contractor services Sonoma, Napa, Marin, San Francisco and beyond.